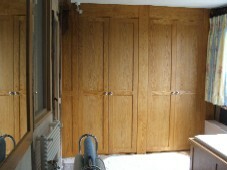 These doors were comissioned to fit in front of an existing wardrobe when the bathroom / dressing room was revamped. The frame was scribed and fitted to the uneven surfaces on all four sides thus giving something square for the doors to hang on. The doors have solid oak frames with matched veneered panels in the middle, the hinges being supplied with soft close mechanisms. If you are updating a room in your home and require something fitted, come and visit us at the workshop. Just call first to make sure we are in and not delivering on 01580 830841.